What is Closed Cell Foam? 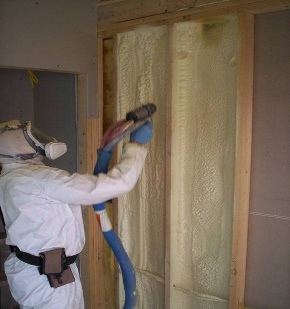 Closed Cell Foam is an insulation product applied wet through a spray process. Much like a paint sprayer, our coating guns disperse the material specifically where the installer directs it. This helps to ensure complete coating and eliminates "cold spots" due to gaps or missed areas. Closed Cell Foam expands as it cures, or "dries". During this process, the foam expands directly into any cracks, or gaps which may allow heat loss if not properly sealed. As shown in the picture to the left, the coating process allows for application in areas that conventional insulation types would be prone to develop possible heat loss. In addition to the sealing capabilities of our product, it is equally as diverse in its uses. Unlike conventional insulation procedures, which use fasteners during the installation process, our wet application process allows this product to adhere to most any surface permanently, the first time. Hard to reach areas, metal structures, conventional construction, it doesn't matter. Let Spray Foam of Maine, LLC show you how we can help decrease your energy and heating costs while providing many other benefits not usually associated with the insulation process.